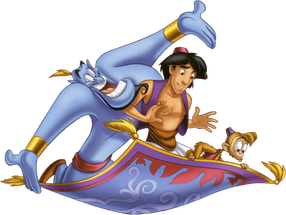 Get your tickets to Walt Disney's Aladdin Jr. -- before they sell out! ​Select one of two ways to pay — online or with a cash or check. ​Deadline for ordering tickets is Monday, Dec. 5th. ​Pick up your tickets at Will Call on the day of the performance under your name and email address. PLEASE NOTE: ALL BUT ONE SHOW ARE SOLD OUT!!! Download and fill out the Ticket Form below so we know where to send your tickets. Include cash or check with a Ticket Form. Checks should be made to "Del Mar Heights PTA." Bring the completed Ticket Form and payment to the school office. Be sure to timestamp the Form using the timestamp machine in the office as tickets are first-come, first-serve. Tuck the Form in the gray PTA box that sits on the right hand side of the front office as you enter the door.